Divorce is one of the hardest decisions a person has to endure. The undertaking can be emotionally painful and should not be entered into lightly. Much thought and consideration goes into it before the decision is made. If you decide to proceed, it is critical that you learn and understand the differences between legal separation, divorce, and dissolution. Legal Separation is an arrangement by which a couple remain married but live apart, following a court order. In a legal separation, the marriage remains legally intact, but the issues addressed by the court in a final order of legal separation are the same matters that are dealt with in a divorce or dissolution. There are many reasons why a legal separation is the road some people take instead of divorce or dissolution of marriage. The emotional impact of being divorced — both parties cannot accept the significant social and psychological impact. Religion – some religions prohibit divorce. Financial considerations to remain technically married. Health insurance. Many couples are motivated to remaining married (legally separated) because of health insurance. In some employer health insurance plans, the coverage and costs change if you divorce, but not if you get a legal separation. Social security. The need to remain married in order to meet the 10-year requirement for social security benefits. 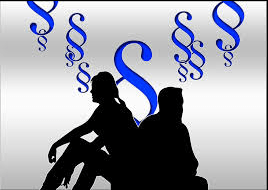 The decision to legally separate generally means there is a strong desire to provide financial support to the spouse. Divorce or Dissolution is a legal dissolution of a marriage by a court, a couple is no longer married. However, in all cases, the court addresses the same matters whether it be pertaining to residential parent, legal custodian, parenting rights, child support, spousal support, division of property and payment of debts. Legal separation agreement may later be the basis for grounds for a divorce. However, the marriage remains legally intact until one of the parties says differently. While both of these process annul or put an end to a marriage, there is a difference. It’s important to know when selecting between a divorce vs. dissolution – a dissolution of marriage in Ohio is a much different process than that of a divorce. While a divorce may end in settlement instead of a trial, a dissolution begins and ends as a settlement between the parties. Additionally, there does not need to be “fault” for a dissolution like there is for a divorce. Whether a legal separation, a divorce, or a dissolution, if you find yourself down this path, our attorneys will provide you with the one-on-one attention needed for your family law matters and are here to explain all of your options. Contact Skinner & Associates Attorneys at Law or call 614-664-0200 to schedule a consultation. We are here to help you through the transition.